When I bought my townhome 18 years ago, it came with the original windows. These windows were a PITA to say the least! Some of them barely opened, or if they did open, they would slam shut all by themselves. Cleaning them was out of the question – it just couldn’t be done. So for years, I looked out of those dirty windows hoping for the day I’d be able to replace them. Fast forward, and today I use the same method I’m going to outline for you here. My professional window cleaning tips clean my windows to perfection, and they’ll clean yours too! What I’ve learned in the years since I started my professional cleaning business is what I’m going to share with you today. Windows can be tricky. It’s easy to leave them in worse shape than when you started. It all starts with the right equipment. Having the right equipment is essential to getting your windows to look fantastic, just like a professional cleaned them. You’ll need good quality equipment that can be easily found at any large hardware store or cleaning supply shop. They make specific buckets for window cleaning. They are long and slim, just big enough to fit the squeegee and mop. The squeegee is the most important tool in the window cleaning process. If you’re serious about getting your windows cleaned like a pro, buy a good quality squeegee. A quality squeegee will come assembled in three pieces. The handle, the channel and the piece of rubber supported by the channel. The rubber can be turned over when it gets old, and then replaced when both sides have worn out. There are various sizes to choose from depending on the size of the windows you’ll be cleaning. I own several and use them according to the window I’m cleaning. A scraper usually comes with replaceable metal blades and is useful to get tough marks off, such as paint, varnish or stubborn insect marks. A little one inch, pocket scraper is usually enough for most maintenance jobs. A word of caution: don’t attempt to use a scraper if you don’t know how to use it properly. You could do permanent damage to your glass. I’m going to give you my top-secret cleaning solution recipe… Palmolive or Dawn Dish Detergent and water. That’s it! You can save yourself a ton of money by using either brand of dish soap to get your windows sparkling clean. I’ve tried a lot of them, and I always come back to Palmolive or Dawn. Some people recommend vinegar and water. Here’s why I don’t: it doesn’t suds up. The suds are important to lubricate the rubber as it passes over the glass, making it a lot easier to turn the squeegee. They also make it easier to see any water marks that need wiping off. The suds also help to show up areas that need more scrubbing because the pattern of the bubbles separate more where there is a finger mark or some other dirt. You’ll need a good supply of dry, lint-free or microfiber cloths to complete the cleaning process. Now that you’ve got all your tools lined up, it’s time to clean the windows. 2. Fill a bucket with dish detergent and cold water. Don’t make the water too hot or it will evaporate from the window before you get a chance to clean it. 3. Dunk your squeegee which has the wet cover or washing cloth attached, into the bucket of warm, soapy water. Smear the solution over the entire window. Scrub the window of debris and dirt. This is the time to use the scraper if warranted. If you need to use the scraper, make sure only to pass the blade in the forward direction, i.e. don’t scrape backward – this could drag the dirt, cement, etc. across the glass causing scratches. 4. Remove the wet cover or washing cloth from the squeegee. Working from top to bottom, draw the squeegee across the window, removing the cleaning solution and dirt from the glass. Curve the squeegee downward at the end of each stroke. 5. Use a fresh, clean cloth to wipe the squeegee dry after each pass across the window. Work from the top of the squeegee moving down to the bottom. 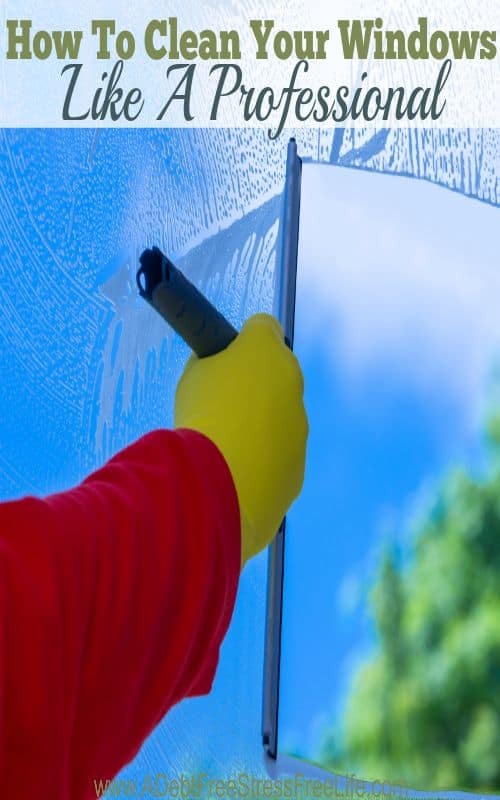 A dry squeegee avoids drips and keeps streaks from forming. 6. When you’re done with the squeegee, run the cleaning cloth along the “wet” side of the window to dry the drips left behind. Move to the window sill and soak up any cleaning solution. Polish the sill dry with a fresh cleaning cloth. Your windows will look amazing, just like a professional cleaned them.